Nestled in the eastern edge of the Himalayas, the Kingdom of Bhutan is considered one of the happiest places in the world. With beautiful mountain views, flowing streams of fresh water, and lush greenery that stretches for miles, how can it not be? But don't get confused - just because Bhutan's a quaint country doesn't mean they don't offer a luxurious vacation experience! You read that right ? the reputed Taj group has a luxury hotel in Bhutan too! Taj Tashi, a joint venture between Taj Hotels and the local Tashi group, opened in Bhutan's capital city Thimphu in 2008. It was the first 5-star hotel in the country. Its design and architecture has been influenced by Bhutan's native Dzong aesthetic. With 57 rooms and 9 suites, along with top-class facilities like a business centre, conference space, in-room dining and baby-sitting services, this hotel promises a beautiful stay in Thimpu. Located in Samten Lam, Chubachu, Taj Tashi is just an hour away from the airport in Paro and was ranked #8 in the Best Hotels in India and the Himalayas by Conde Nast Reader's Choice in 2015. Conveniently located opposite the international airport in Paro, Tashi Namgay is another luxury hotel in Bhutan by Tashi group. It is set amidst lush foliage that stretches for five acres. It has 58 rooms in total that are divided into the executive suite (which includes a home theatre and en-suite bathroom), deluxe cottage, junior suites that are ideal for families and couples, and deluxe rooms that offer a beautiful view of the city of Paro. Tashi Namgay uses solar lights and has a rustic appearance with wooden ?shingle? roofing and brick walls. They offer fun experiences like archery, Bhutanese hot stone baths, khuru (darts), and spa facilities too. Read more about traditional Bhutanese Hot Stone Baths. 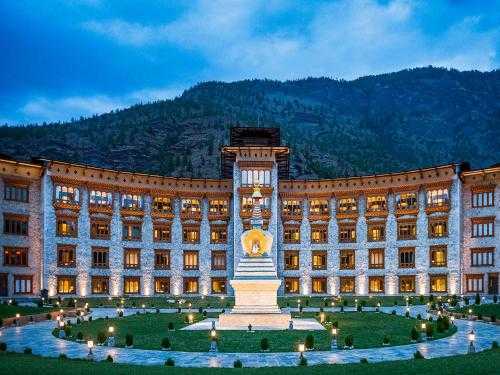 This luxury hotel in Bhutan, opened in 2015, earns its name from its proximity to the Clock Tower Square. It has 28 deluxe rooms which have amenities like flat-screen TVs, private bathrooms, free WiFi and breath-taking mountain views. On the first floor of the hotel, you'll even find a handicraft shopping centre that will help with all your souvenir promises. This hotel's location is one of its selling points ? it is close to major restaurants, cafes (like the reputed Thija Café), and bars of central Thimphu. Within walking distance is Changlam Plaza and by a short drive, you can reach Changangkha Lhakhang and Memorial Chorten. Located in Tshalu Lam, these luxury suites in Bhutan are one of the few pet-friendly accommodations of the country. With options of double bed, single beds and sofa beds in each of their eight apartments, Jigme Suites is immensely popular for providing a wholesome yet luxurious Bhutanese experience. Their rooms offer beautiful views of the mountains, city, or rivers in Thimphu. In fact, if you're keen to explore the great outdoors, they have cycle rental services as well! They have a business centre, bar, free Wifi, and options of an American, Asian or vegetarian breakfast each morning. In terms of sight-seeing, Jigme Suites is a short drive from Simtokha Dzong and Bhutan National Library, and a little further away, you will find Memorial Chorten and Clock Tower Square. Founded by an Australian-Burmese couple in 2013, this luxury hotel in Bhutan looks over the protected nature reserve of Gangtey (Phobjikha) Valley. From the spacious rooms in this homely lodge, you can sometimes spot beautiful black-necked cranes in the relatively untouched valley. Their 12 rooms are designed for two occupants with a choice between king beds or twin beds. Each room has a fireplace, bathtubs, and a lovely stone exterior. In 2017, Gangtey Lodge was ranked #5 in Conde Nast Traveller's list of Best Hotels in Asia. Aside from the comfortable stay, you can take part in their in-house activities like archery, mountain biking and meditation. This hotel chain has properties in Paro and Punakha. Como Uma Paro is situated at 2,200 metres altitude, featuring 9 private cottage-villas that are a cosy 92 square metres in size. Along with this are 20 rooms in the main building that are each 32 square metres. Their rooms feature handcrafted Bhutanese stone and timber designs, along with a fascinatingly yurt-shaped restaurant serving organically-sourced ingredients in the main building. Meanwhile, Como Uma Punakha overlooks the beautiful Punakha Valley with 2 private villas and 9 rooms. The hotel is located close to Punakha Dzong, a 17th century temple/fortress that was once home to the Bhutanese government. A popular chain of luxury hotels around the world, Le Meridien has two luxury hotels in Bhutan. Le Meredien Thimphu has a significant 78 guest rooms, including nine spacious penthouse suites. This makes them the hotel with the maximum rooms in base category in Bhutan. This property is close to Changangkha Lhakhang and the Phajoding Monastery, as well as Memorial Chorten. Le Meridien Paro is nestled on the banks of the Paro River and features a beautiful Buddhist stupa just outside its doors. Less than half an hour away is Paro Taktsang monastery. If you're looking for a happy accommodation, Le Meridien's hotels promise top-class amenities and hospitable service. Derived from the words áman? (the Sanskrit word for peace) and ?kora? (the Dzongkha word for pilgrimage), Amankora has luxury hotels across Bhutan, situated in Paro, Punakha, Bumthang and Gangtey valley. They incorporate traditional Bhutanese design aesthetic, such as a farmhouse in Punakha that was built by the former chief abbot of Bhutan. From their 2-bedroom units to their luxury suites, each accommodation boasts of beautiful views of orange orchards and sprawling green landscapes. Each establishment has been carefully designed by famous resort architect Kerry Hill. Zhiwa Ling properties can be found in Paro and Thimphu. Zhiwa Ling Heritage in Paro Valley spans 10 acres, the accommodations featuring designs handcrafted by local artisans. Their premiere suite is the Royal Raven Suite, named to honour the Raven Crown of Bhutan, Uzha Jarog Dongchen. This has a dining room, private shrine room, private porch and two luxurious bedrooms. Their other suites, Mahnolia and Drugyel, are spread across 8 cottages. They have bathtubs, Swedish underfloor heating, plush sitting areas, and private balconies - in fact, these rooms are some of the largest standard rooms in Bhutan. In the property's main building is an in-house temple built from 450-year-old timber. Zhiwa Ling Ascent in Thimphu was created as collaboration between Austrian and Bhutanese project planners. It has 20 spacious rooms, both deluxe and premiere, with gorgeous landscapes of cypress trees as far as the eye can see. With the endless sight of scenic hils and mountain beauty in every direction, staying at one of these luxury hotels in Bhutan, with their world-class amenities and highly courteous staff is all you need for a royal treatment in the Himalayan Kingdom. Come be a part of the grandeur, and experience first-hand why Bhutan is one of the happiest countries in the world! Exploring Himalayan Wildlife at the 4 Wildlife Sanctuaries of Bhutan!